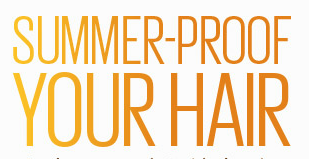 You wouldn’t spend hours in the sun without applying suncream – so why treat your hair any different? 1. Make sure you remove chlorine and salt build up. The most effective way is to get the right shampoo – this is especially important for coloured hair! We recommend: Aveda Hair and Body Cleanser. 2. Restore the hair by replacing the lost moisture. We recommend: Aveda After Sun Hair Masque. 3. Protect the hair from UV exposure when your indirect sun light for long periods of time. We recommend: Aveda Protective Hair Veil. For the whole of May we are offering 10% off each of the Sun Care products OR if you fancy all 3 products we can give you 15% off the whole set.